On April 10-11, 2013, CCROM SEAP in collaboration with the Asian Development Bank hosted two days National Workshop entitled Mainstreaming Climate Change in Citarum River Basin Management at Jakarta and Bandung, Indonesia. The workshop was a part of the pilot project of TA ADB 7189 - INO package E: Institutional Strengthening for Integrated Water Resources Management in the 6 Cis River Basin Territory project, led by ADB in partnership with AECOM, CCROM SEAP, Ministry of Environment, and West Java Province Environmental Management Agency (BPLHD). The main objective of this workshop was to identify challenges, barriers, and opportunities for local government to implement the future adaptation and mitigation efforts by taking experiences from the efforts in other river basin management, and to make all parties taking roles in river basin management to reached the river basin system that has a high resilience to the impacts of climate change. The 150 workshop participants including facilitators for two days workshop represented by the Indonesian governments, NGO, and business which delivered their experiences and ideas for this workshop. The first day of national workshop was held in Bidakara Jakarta, began with an overview by Prof. Emil Salim (former Minister of Environment) of river basin main functions and the four models of multi-stakeholder approach that can be used as an example to improve Citarum River Basin management system, followed by presentation from Dr. Mubiar Purwasasmita (DPKLTS Tatar Sunda), Prof. Rizaldi Boer and Dr. Lala Kolopaking (CCROM SEAP), Dr. Irfa Ampri (Ministry of Finance), and Tulus Sibuea (BPLHD Prov. Jawa Barat). 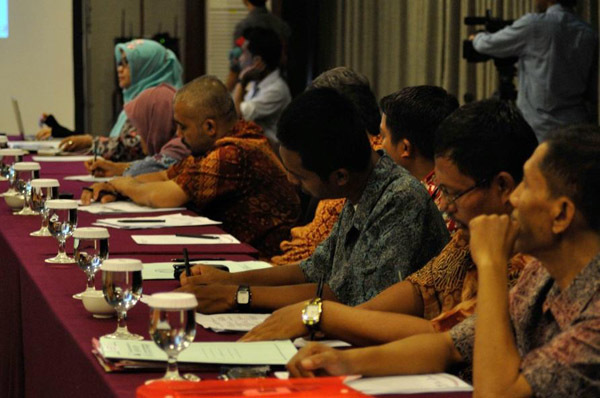 The second day of national workshop, April 11, 2013, was held in Aston Tropicana Hotel Bandung. The workshop began with presentation from Tulus Sibuea as representative from BPLHD West Java Province. He delivered the importance of visualization of synchronization plan for community in managing Citarum river basin, as well as several activities and initiatives developed by BPLHD including quality monitoring via Deconcentration Fund. The presentation followed by Mrs. Endang (BLHD Kabupaten Bandung), Sudar Atminto (IME Citarum), Prof. Nurpilihan Bafdal (UNPAD University), and ended by Rizaldi. Z (Perum Jasa Tirta 1).